The 2012 Festival of Flowers in Praise is being held at St Paul’s Cathedral this weekend (11th - 14th February). Once again, Saint Peter’s is represented by an impressive creation. Following the theory of staying with what works, Parishioners Faye-Noel Brown and Gwen Hudson again created Saint Peter’s entry. The theme for the festival is "Lead Kindly Light", and our ladies chose to use an apt quotation from Edith Wharton, "There are two ways of spreading light: to be the candle or the mirror that reflects it". 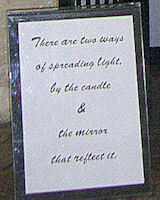 The text is interpreted by use of glass and mirrors. The line of the arrangement not only reflects the light from a number of angles, but establishes a pathway through which the eye can follow the light. The beautiful white chrysanthemums emphasise the purity of the reflected light. Photo’s: Shelley Scoular, Information Services Otago Ltd.
See our entry in the 2011 and 2013 Festivals.